The Chicago-based band is comprised of Erick Crosby (lead singer), Drew Rasmussen, and Jeff Papendorf. Instrumentally they’re a textured sonic pulse that’s not unlike The Album Leaf during their contemplative moments, but also like Explosions In The Sky with that omnipresent guitar build-up that slinks and reverbs forth. 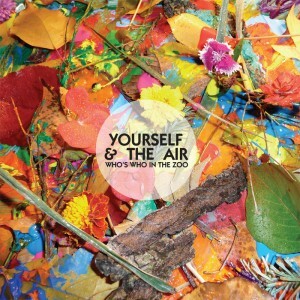 They also have this psychedelic thing going for them, kind of like Animal Collective or The Antlers. Crosby’s voice brings you back to the early ‘00s when adolescent falsetto angst was in, but he thankfully cuts out most of the angst. The stand-out song for me is “Bicycles Plus.” They bring in a harmonica for the first part of the song, but then transition into a slow crescendo of synth, snare and kick drum, and harmonious “oohing” back-up vocals, not to mention full-reverb guitar awesomeness. With lyrics like “I’m going to color outside the lines while I still have time,” it’s easy to relate to Yourself And The Air’s reluctance towards adulthood. But with a sound as soaring, textured and thoughtful as Who’s Who In The Zoo, maybe hitting musical maturity isn’t so bad.